The Xero crew have a quandary right now. 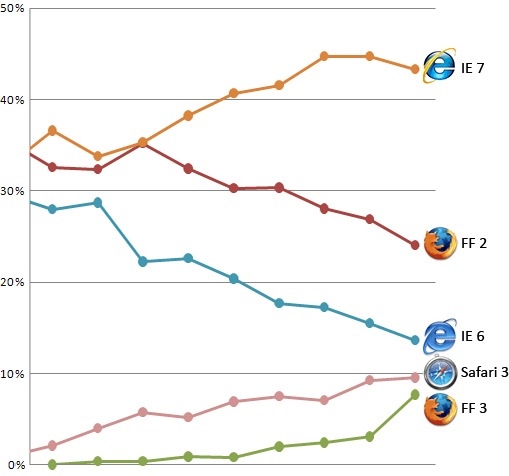 As the graph below shows, The percentage of their users utilising ie6 is fairly small. ie6 also has some inherent flaws in terms of security and current standards compatibility. Because of all this Xero went out to the community asking people whether or not they should discontinue support for ie6. Firstly kudos to Craig for asking their user base the question and not making a unilateral decision. Your stats are misleading – your current customers are early adopters: In the broader market for your products, you will have almost as many users on IE6 as IE7 (I know as I checked our stats last week). You might want to wait on this one, unless you have a good reason to ceasing IE6 compatibility. As the commenter pointed out, SaaS vendors considering browser compatibility need to look seriously at where their market is. Xero for example is (or needs to be) a mass market product, the accounting system of choice across the spectrum of businesses. I’m not talking just designers and web companies here but Stuart the plumber and Ben the electrician. So in effect Xero needs to support the browsers used by all business users at an aggregate level. The graph below shows browser stats worldwide – of course it is an aggregate of consumer, SME and enterprise use but if we accept for a moment that these three users types share similar characteristics, the we can see that by closing off support for ie6, Xero would be cutting out over 25% of its potential market – bad move for a mass marketer. A SaaS vendor who is targeting a specific niche, should look at the usage demographics for that particular niche. A SaaS product aimed to be used by web developers for example is unlikely to need ie6 support. Horses for courses people – the best advice is to really really know and understand your market. I suspect that organisations with large centralised desktop deployments are the last bastion of IE6. I also suspect that this is not Xero’s target market and they could easily consider dropping IE6 support before year end given the sharply declining trend. @Terrence – I reckon you want to have a look around a few Ma and Pa SME’s before you come to that conclusion…..
Nigel Parker from MS ran a session around phasing out IE6 at Barcamp on Saturday. He presented some NZ stats – around 25% of browser sessions in NZ are IE6, and most of those are running XP pre-SP1. Some is big organisations being slack (looking pointedly at a number of Government departments here). But for Home/SME users – if they’re on dialup there is no way they’ll ever get through Gigabytes of updates in 20 minute periods of email-checking a few times a week. IE updates, Windows updates, Adobe updates … they all add up. And they need to be on XP SP2 before they can install IE7. Either they’ll need to install CDs with the relevant updates on, or they’ll get a new computer because their current one will die. I don’t see any other options. Dropping IE6 would be great but it’s definitely not an option for Litmos yet. As a training product 1 customer for us can see our reach go out to a large number of users within an organisation. Just looking at our current browser stats for actual users of the system the breakdown goes something like this. The majority of our customers are call centers or manufacturers, typically not your early adopter crew i suspect so that could explain the IE6 dominance. Xero has made a really smart move choosing Accounting network to deliver its software. Using this, they have a real chance to reach non early adopters and to cross the “chasm”. Just because of that, IE6 has to be kept since they will probably follow a different path than other SMB SaaS providers using pure online marketing.